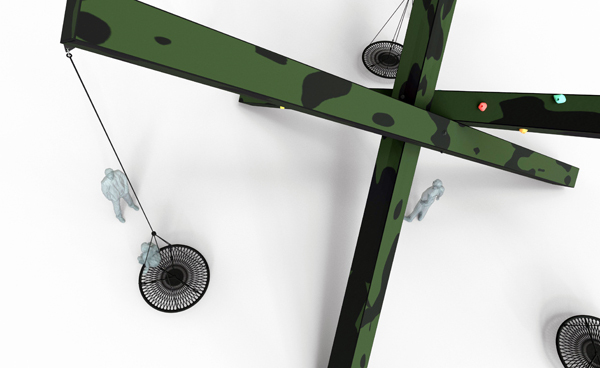 We are currently working on a large permanent public art project in Denmark. Together with Anne Romme and Anne Bagger we are also working on a large scale project based on the SPACEPLATES GREENHOUSE with a collaborator in Florida, USA. We had a very busy year in 2017. We participated in the 11ª Bienal de Arquitetura de São Paulo, Gwangju Design Biennale, State of DESIGN, Berlin, Ecovention Europe, Museum De Domijnen among other exhibitions. The XYZ CARGO project is constantly growing and developing and new models are added. The learning process of creating and maintaining a sustainable art-business is very satisfying. Have a look at xyzcargo.com or look up @xyzcargo on Facebook. 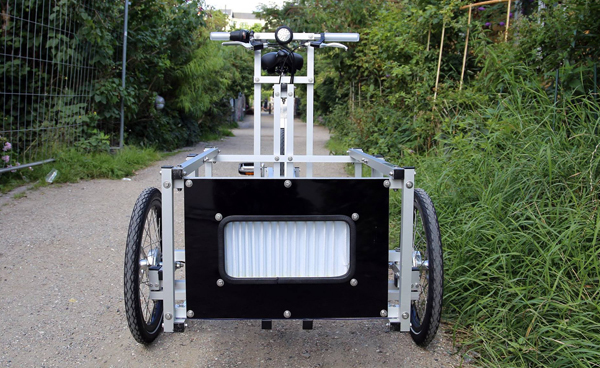 The XYZ CARGO CLEAN AIR TRIKE actively removes harmfull particles from the air. 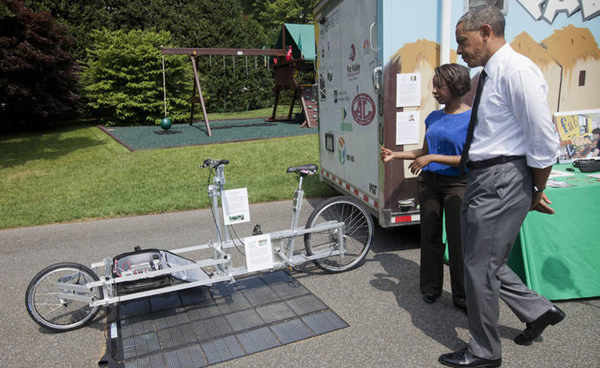 At a cycling speed of 25 km/h the system cleans 4.86 m3 of air per hour. A human being would inhale about 0,5 m3 per hour. The filter removes between 80 and 90 percent of 0,4 μm size particles from the air. The clean air is distributed in public space and hereby shared directly with other persons. The CIRCULAR LIVING SYSTEM is based on the open source system XYZ OPEN CITY by N55 & Till Wolfer - a modular construction system for rooms and infrastructure. 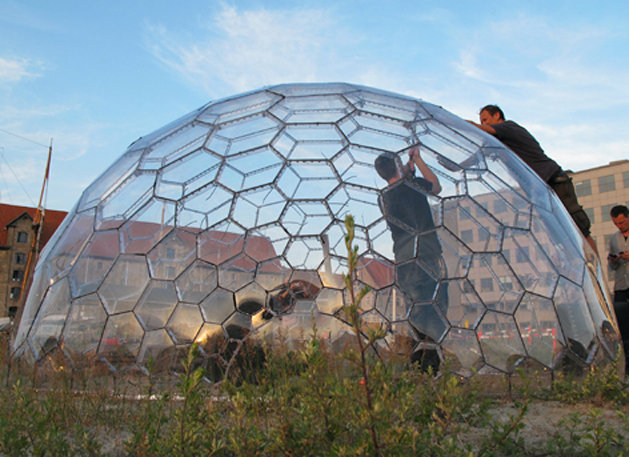 The CIRCULAR LIVING SYSTEM was developed by Till Wolfer & N55 in cooperation with Dirk Manns. 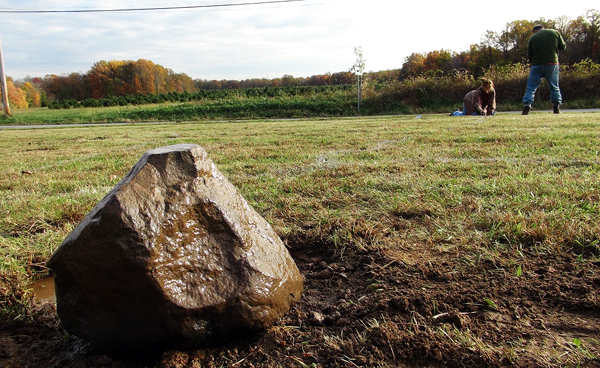 All elements can be made inexpensively with hand tools made of standard materials themselves. 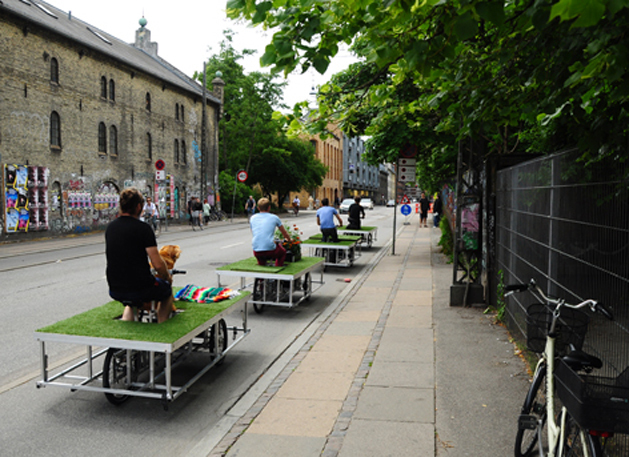 If anybody should wonder why we focus so much on the XYZ CARGO project these years, (we are working on other projects too) here is an article that might provide some degree of overview: CARGO BIKES AS AN ARTISTIC MEDIUM. 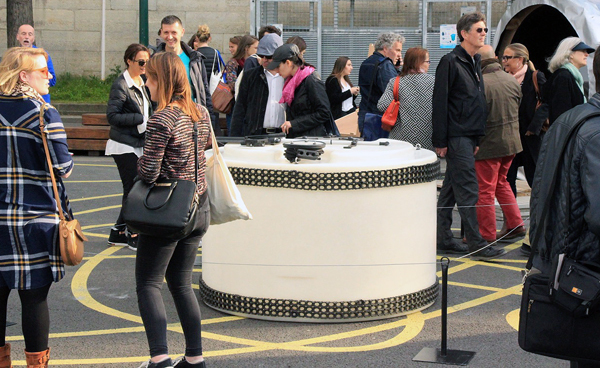 It is a way of operating in public space and trying to work with the aesthetics of setting up a fair production and distribution of things at the same time. Have a look at xyzcargo.com or look up @xyzcargo on Facebook, or instagram xyzcargo to see the latest developments. 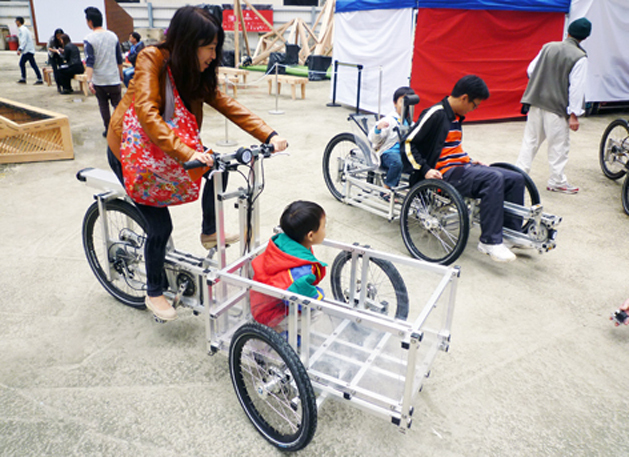 We are busy developing the ROOMCYCLES/ XYZ CARGO TRUCK. More about that soon. New exhibitions comming up soon as well. 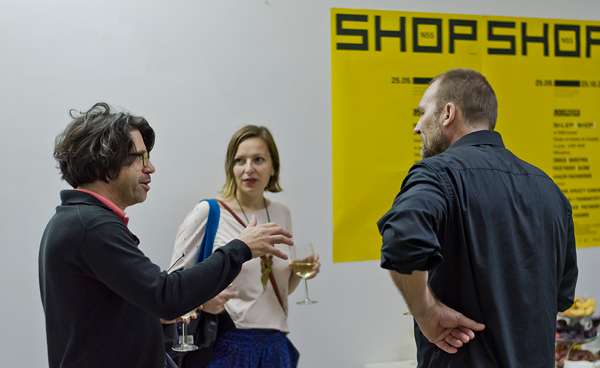 We are currently participating in exhibitions at museums in Budapest, Berlin, Dresden and Gent. 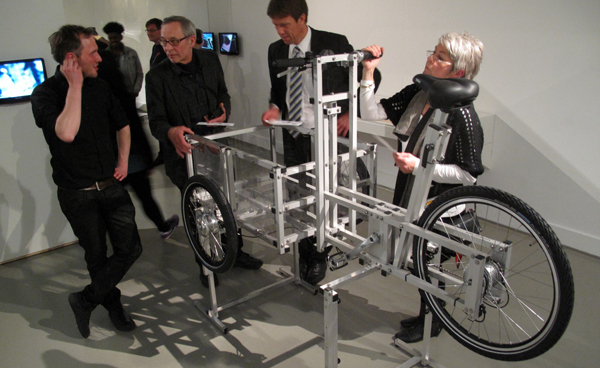 We recently took part in the Triennale der Moderne in Dessau. 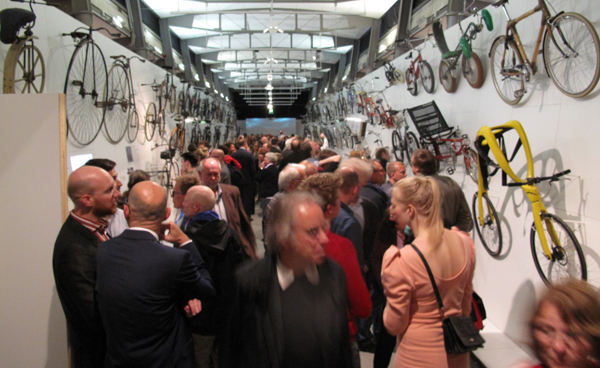 It has been a very busy year with a focus on developing the XYZ OPEN CITY project further together with a number of collaborators and of course the XYZ CARGO project. Learning how to share and developing and exploring the aesthetics and ethics of production and things that we need in our everyday life is becomming more and more important. We are standing at a crossroad: Either we find new ways of producing things locally in a socially and environmentally sustainable way and develop systems of distributing raw materials in a fair way globally or we will find ourselves in a situation where production and raw materials are controlled by very few extreemly wealthy and powerfull organisations/ persons. We have done a lot of talks and workshops in the last three months. Also for students visiting our studio here in Copenhagen. 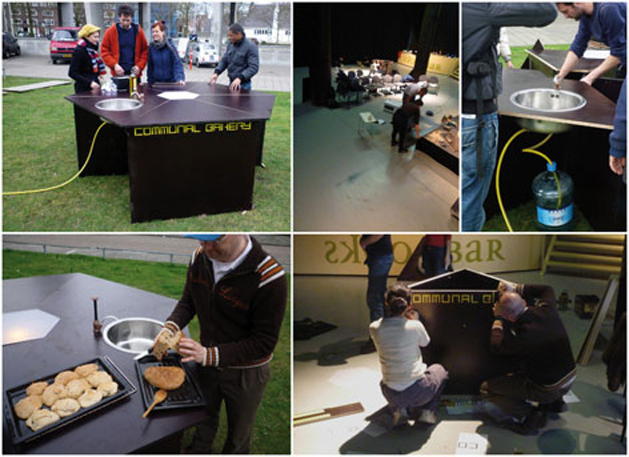 Together we made quick interventions in public space using the XYZ OPEN CITY system. 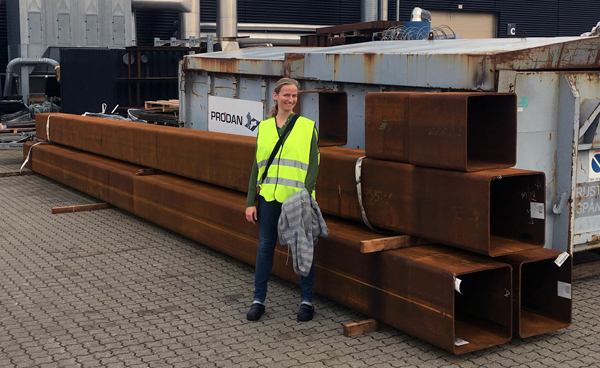 Together with Anne Romme we are working on several SPACEPLATES projects in various countries. We will develop this project further in the comming years. It has been on hold for a while due to Anne finishing her PHD. It has been a very busy spring. We have shown a large version of XYZ OPEN CITY in Aarhus Denmark and we did an exhibition/ workshop/ porposal for a new arboretum centre at Carleton college, Minnesota, USA. We have increased the production of XYZ SPACEFRAME VEHICLES as part of the Open Source based business XYZ CARGO. 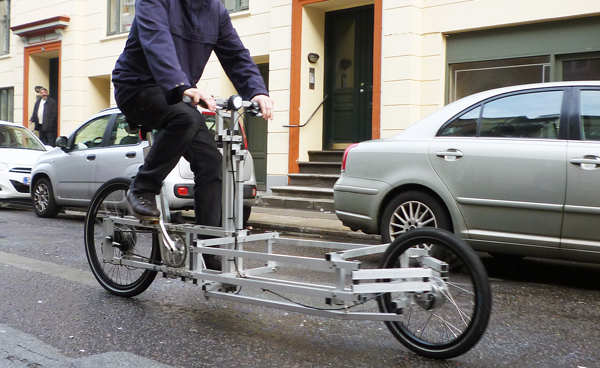 People are riding XYZ CARGO cycles in more and more places primarily in Europe. 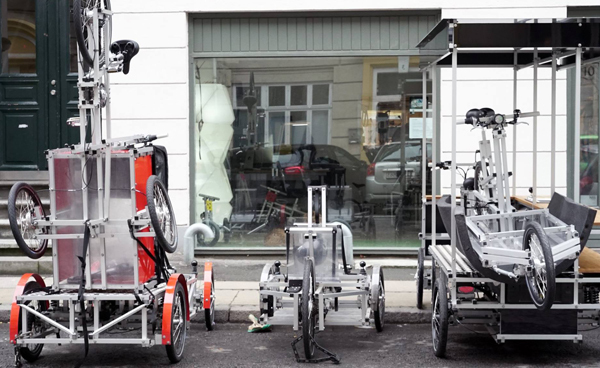 "The ROOMCYCLES is an Open Source, low cost modular system that can be used by persons to reclaim, use and inhabit areas like streets or parking lots normally reserved for cars. 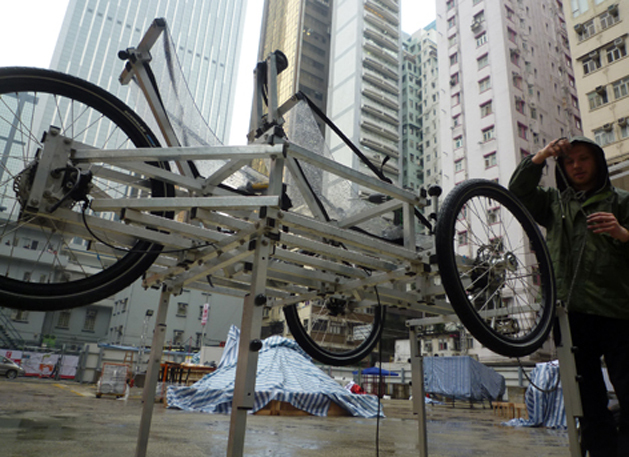 A basic ROOMCYCLES unit consist of a four wheel human powered mobile platform with a minimal room mounted on top. 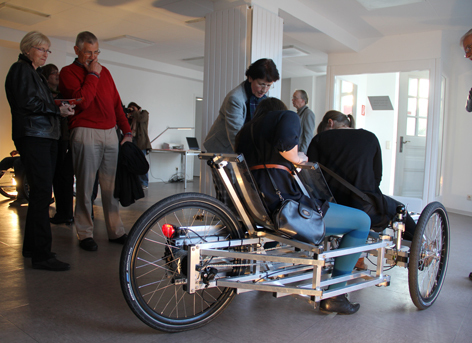 Each of the ROOMCYCLES can be customized to function for example as a single unit living space, an office, health clinic, workshop, small factory, shop, café or similar. 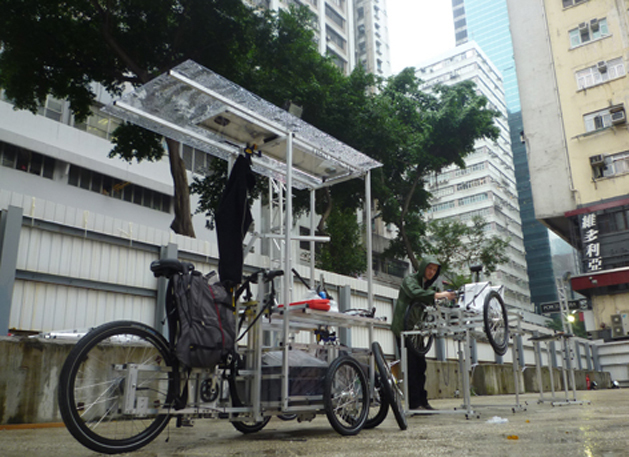 ROOMCYCLES can also gather up and be combined to form larger temporary rooms and buildings. 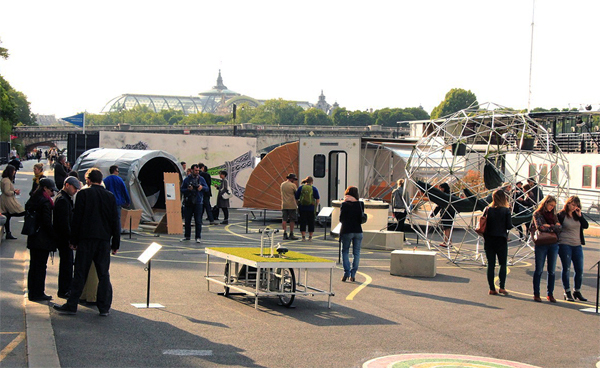 In this way a new layer of flexible, affordable, mobile and legal rooms and buildings can be added to an existing city layout and make room for new forms of social activities and ways of living." WELCOME TO XYZ OPEN CITY! 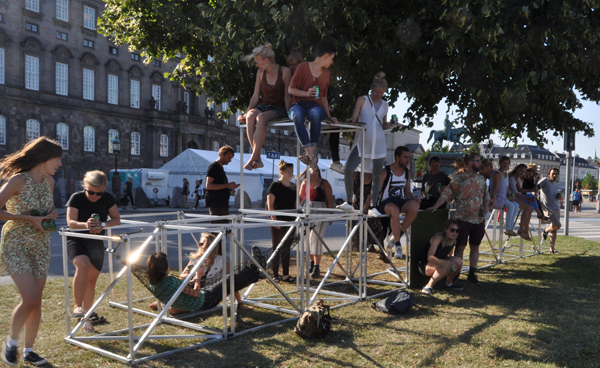 XYZ OPEN CITY is an open source, modular, low cost system made by N55 that persons in local communities can use as a tool to implement a wide range of shared functions in public space. With XYZ OPEN CITY N55 proposes to share things in public space as an alternative to state or private ownership and hereby to establish new commons. XYZ OPEN CITY can plug into existing infrastructure and change the functions of existing buildings, indoors or outdoors, or it can be used to build a new city from scratch. 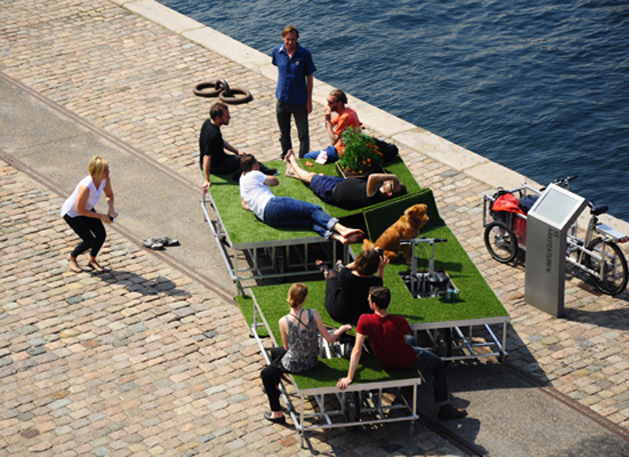 The XYZ OPEN CITY system can be seen as a do-it-yourself urban planning tool; An alternative to the top down urban planning that dominates most cities in the world. 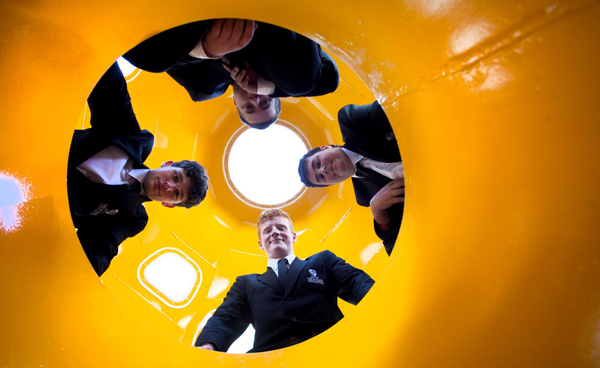 N55 encourage persons to build their own XYZ OPEN CITIES. 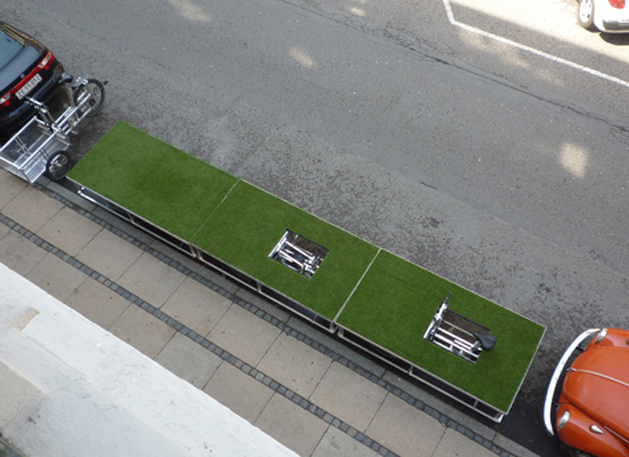 The XYZ OPEN CITY constructed at Aarhus Kunsthal has an emphasis on sharing and local production and distribution. Not just the actual production of things and distribution of actual things but also the production of meaning and that what is significant to us in our everyday life. Among other things we are setting up a temporary XYZ OPEN CITY in Estonia, developing a new project called ROOMS CYCLE, working on the socially and environmentally sustainable XYZ CARGO project ( art as a part of everyday life), participating in an exhibition at the Songwon Art Center in Seoul, Korea. 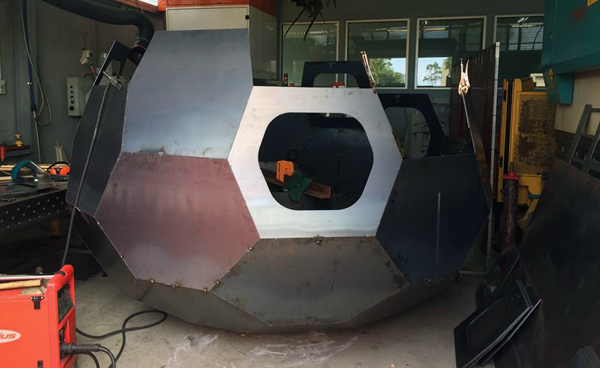 On top of that we have to deliver the final design and finish the manual for the UNDERWATER HABITAT project in Sydney, Australia in early Oktober.. 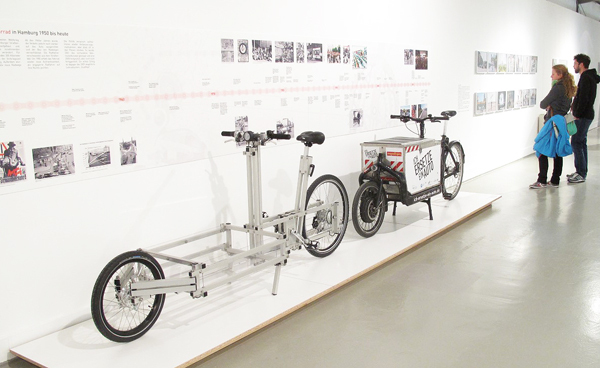 The XYZ CARGOs are part of the new exhibition “Das Fahrrad / The Bike” in Hamburg’s Museum Of Work. Our new XYZ CARGO homepage is up and running and almost ready: www.xyzcargo.com. WALKING HOUSE is currently part of a show at the MOA, Museum of Art, Seoul Korea. 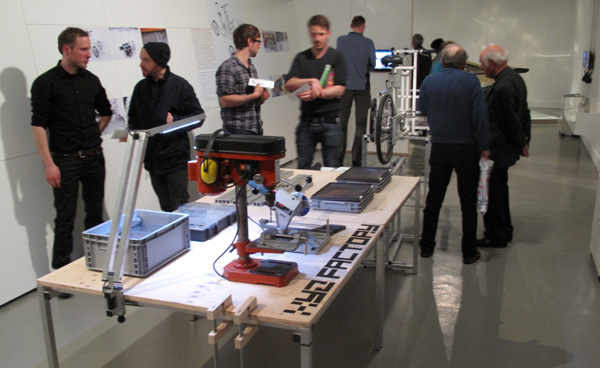 PARCYCLE SWARM is represented at the exhibition URBAN NATURE at the Copenhagen Museum. 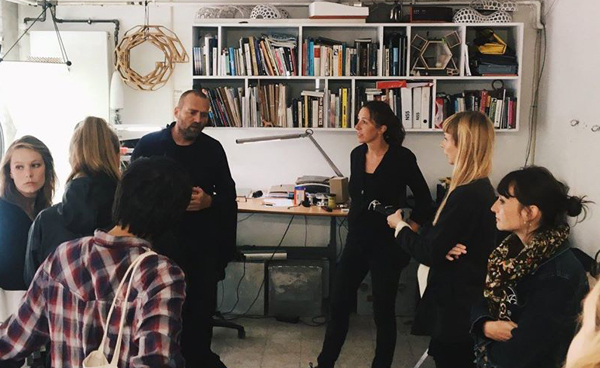 Recently we were invited to be part of a roundtabel discussion at DAC, The Danish centre of Architecture as part of the Copenhagen ArchitectureX Film Festival. The Swedish Documentary MICROTOPIA, that we are participating in, was also shown on this occassion and by the Danish national television. We are still working on the large scale urban development project in Hedehusene in the outskirts of Copenhagen, invited by White Architects. Its getting more and more clear to us how we all need to: Scale down consumption, take up less space, share more, repair more and produce as much of the things that we need in our everyday life locally. its also crucial to develope systems for fair distribution of raw materials and our planets ressources in general. The XYZ CARGOS are an important part of N55´s attempt to find ways of living in compliance with all this. 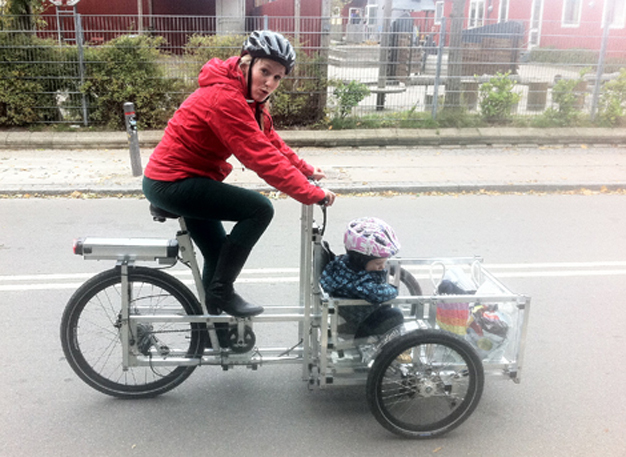 The XYZ CARGO BIKE is based on the XYZ SPACEFRAMES VEHICLES and hereby on the general XYZ NODES system. the new manual for XYZ NODES can be found here. We are involved in a large scale urban planning project in Hedehusene, Denmark, with White Architects, Malmø. N55s main strategy is to convince the clients that a major distribution of power in society is needed, in order to find ways of existing with as small concentrations of power as possible, so that any real changes can happen. The power of logic versus the logic of power. The guys at White have created a fantastic team of specialists in very different fields and its really interesting to be part of this. 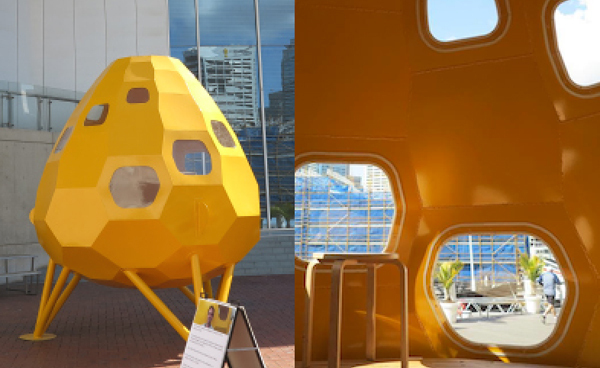 Together with architect Anne Romme, Engineer Anne Bagger and Engineer Daniel Sang-Hoon Lee, we are developing a SPACEPLATES underwater habitat, for marin biologist Loyd Godson, to be placed at the Great Barrier reef in Australia. Its going to be realized soon. We have just started a new collaboration with Dane Shea aiming to make an open source XYZ 3D PRINTER. It will be based on the XYZ NODES system and different open source hardware and software. Really exciting! We are currently planning a situation in Denver Colorado together with Architect/ Artist/ Curator Rori Knudtson later this year. 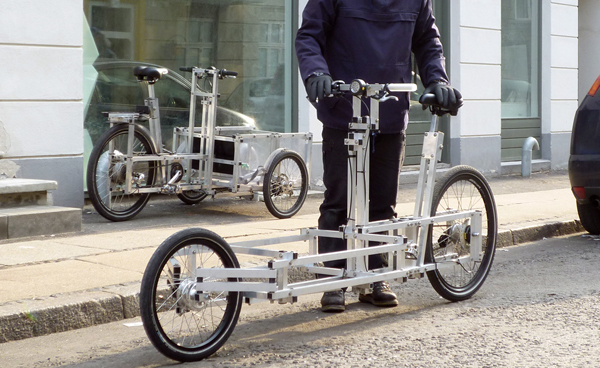 It will include the use of XYZ CARGO cycles s and maybe also the XYZ OPEN CITY. 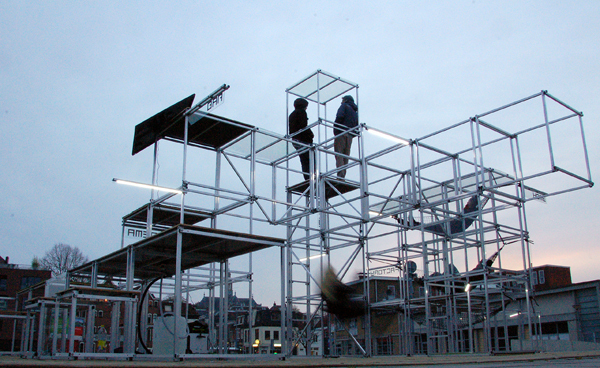 We have just finished installing a prototype of XYZ OPEN CITY in Groningen, The Netherlands. 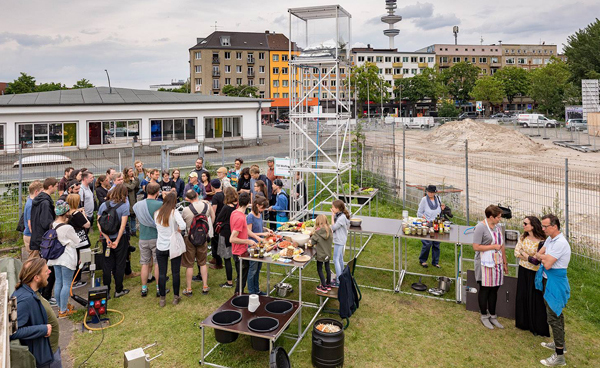 XYZ OPEN CITY is an open source, modular, low cost system that persons in local communities can use as a tool to implement a wide range of shared functions in public space. 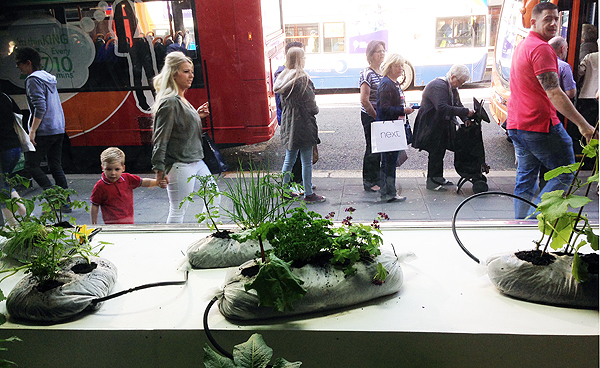 The XYZ OPEN CITY system can be used to build anything from urban gardens to fully functional insulated housing. 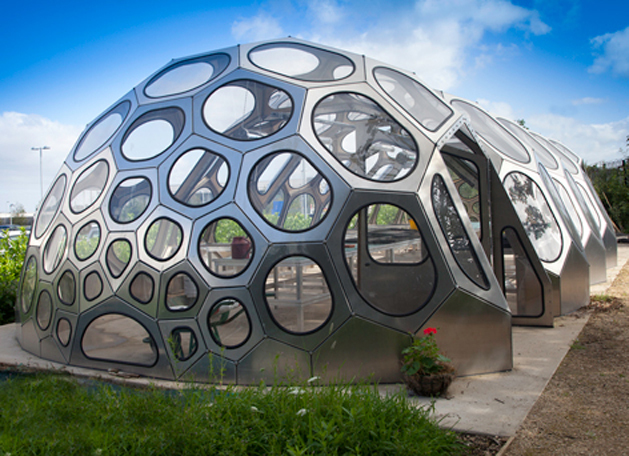 Building materials can be new or recycled. 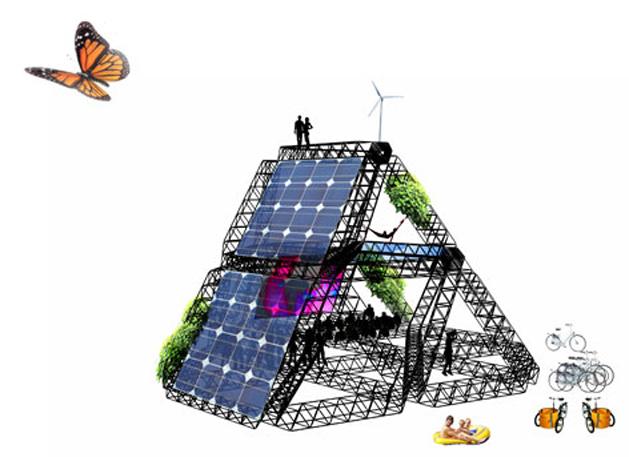 XYZ OPEN CITY constructions can be dedicated to a specific purpose like for example an OPEN POWER STATION based on solar panels and/or wind turbines or it can form multifunctional buildings providing a variety of facilities. It can also be used to construct new infrastructure like bridges, etc. With XYZ OPEN CITY N55 proposes to share things in public space as an alternative to state or private ownership and hereby to establish new commons. XYZ OPEN CITY can plug into existing infrastructure and change the functions of existing buildings, indoors or outdoors, or it can be used to build a new city from scratch. When the system is implemented in an area, it can grow in relation to local needs and wishes. 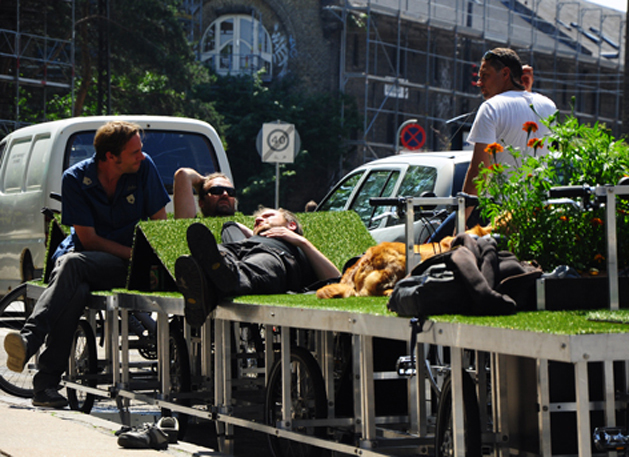 The XYZ OPEN CITY system can be seen as a do-it-yourself urban planning tool; An alternative to the top down urban planning that dominates most cities in the world. N55 encourage persons to build their own XYZ OPEN CITIES and hereby influence their local urban environments. 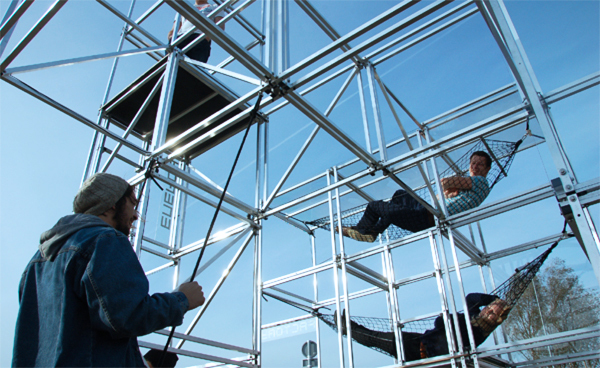 The single modules are so lightweight that a crowd of people can carry one each, gather up at a site and quickly create a large structure with different functions in public space. 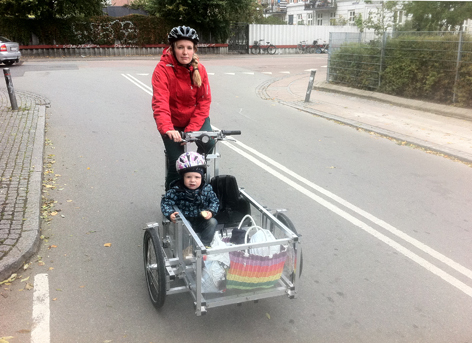 We have just tested the new PARKCYCLE SWARM in Copenhagen. 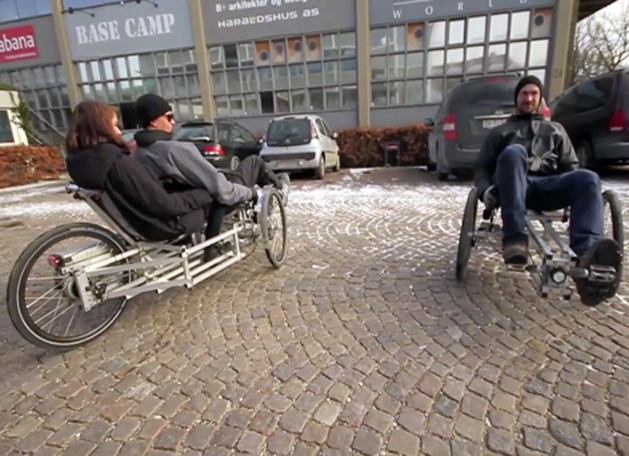 The PARKCYCLE SWARM is a modular system that empower persons to build an instant public park whenever and wherever they want to. 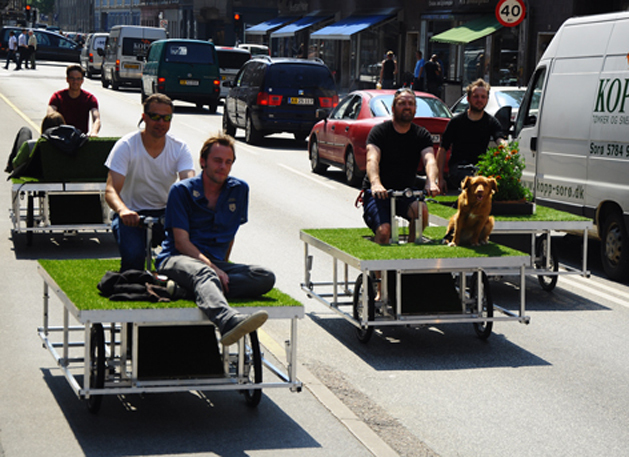 The PARKCYCLE SWARM consists of a number of human powered mobile gardens. The individual gardens can be combined to form public parks. 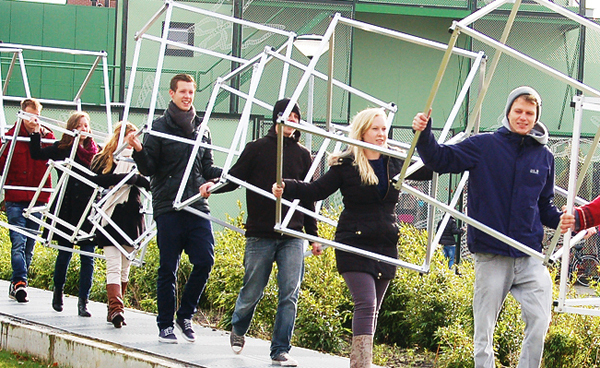 A PARKCYCLE SWARM can consist of any number of individual gardens. 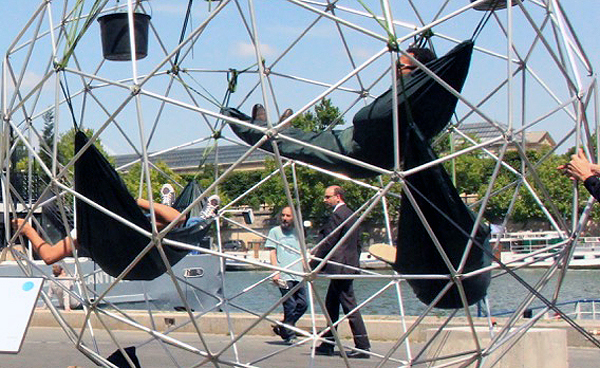 The PARKCYCLE SWARM system is based on the XYZ SPACEFRAME VEHICLES project. ( Please find the manual here). 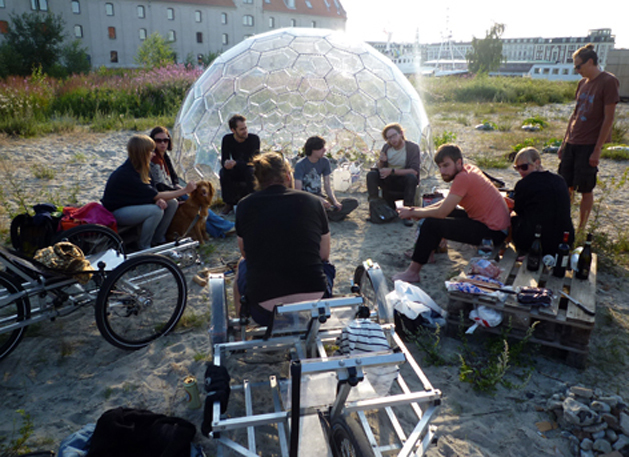 PARKCYCLE SWARM is an Open Source project by N55 and Till Wolfer in collaboration with the Rebar group. We have just finished a 5 day workshop at Pb43 ( A user driven cultural center in Copenhagen ) Have a look at a video made in the situation here. 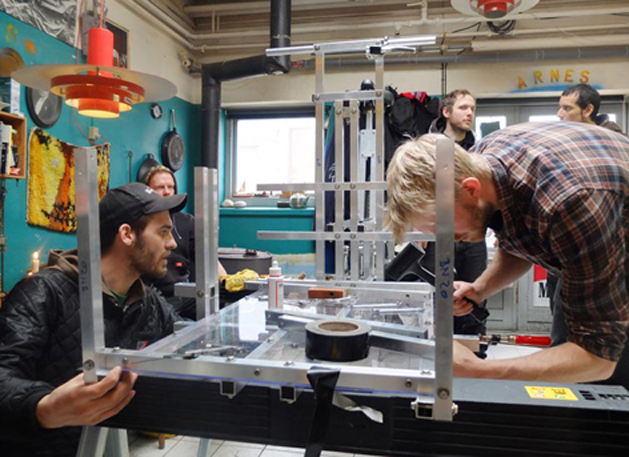 We are currently doing a workshop at the Ecological production school in Copenhagen, Teaching the students how to build a XYZ CARGO from scratch. 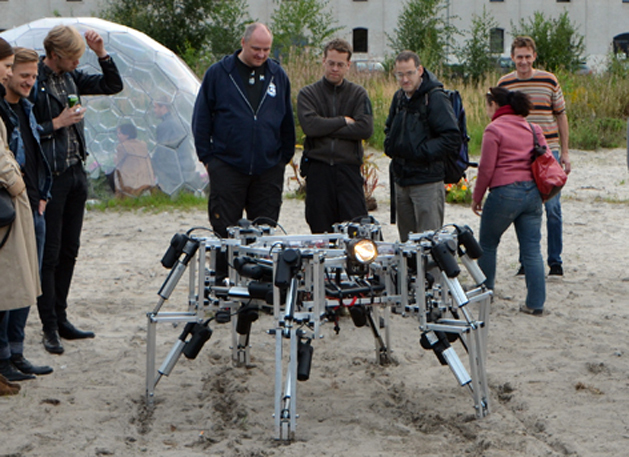 In the next month we will do two workshops in Leipzig, Germany and one in Hamburg. The last couple of months we have been concentrating on developing and finishing the design of the XYZ CARGO. 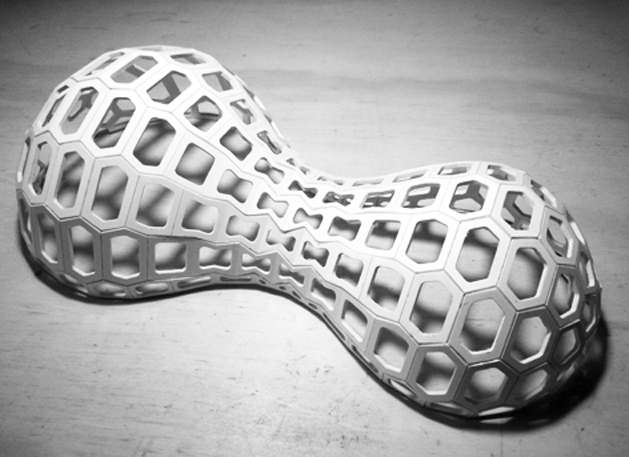 Its based on our Open Source construction system XYZ SPACEFRAME VEHICLES. In order to finance the further development of new free designs we are now starting up a production and distribution of the XYZ CARGO. 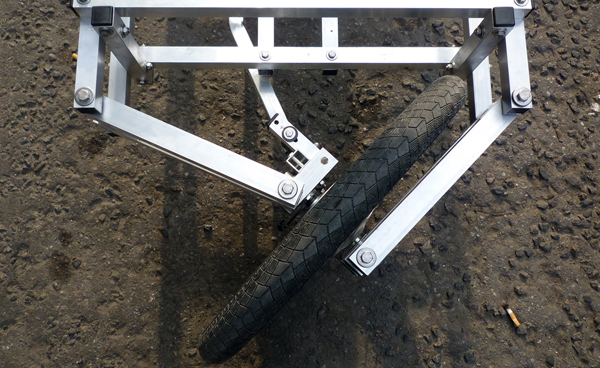 The XYZ CARGO have been thoroughly tested and its ready!. The aim is to produce as much as possible of the vehicle locally and to produce and sell it in a fair way. The economy involved in the production will be completely transparent. It will be published in order for buyers to see what our fee for producing and assembling the XYZ CARGO is. You can preview the XYZ CARGO. com site here. 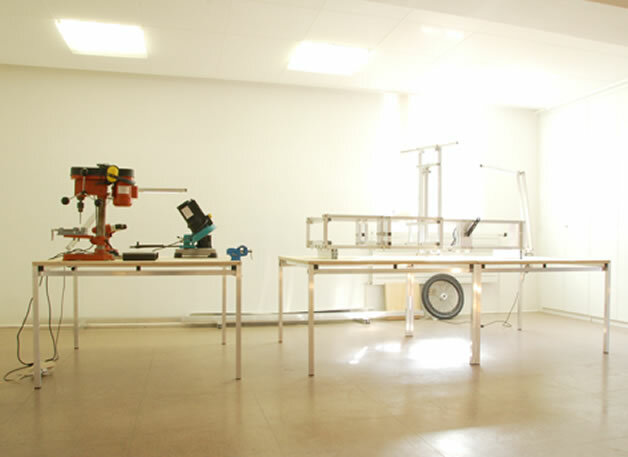 The XYZ SHOP will be fully functional and ready before the first of June 2013. The attempt to make an actual product based on a fair and environmentally friendly way of thinking is part of an ongoing experiment focusing on low tech systems like the XYZ NODES construction system ( manual will be published soon) and high tech systems like the SPACEPLATES. We are trying to find ways of distributing our work where it can become part of any persons everyday life if they want it. At the same time we are researching the ethical and aesthetic implications of production and distribution. Can we find new and more fair ways of producing and distributing things? From now on N55 NEWS will be updated more frequently. It will work as a timeline and new stuff will just be added. We participated in 13 exhibitions in 2012. News about our exhibition activity can always be found at N55 CV. We are participating in the exhibition "Get it louder" in Beijing and we gave a talk there recently. 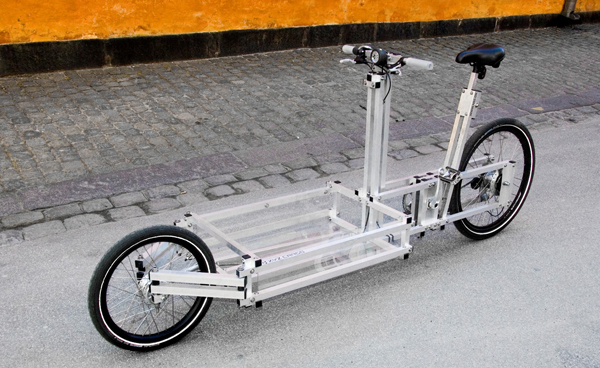 We have developed a new Version of the XYZ SPACEFRAME VEHICLES: The XYZ CARGO. 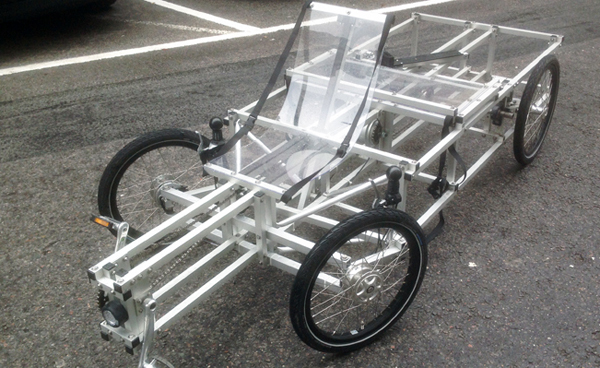 Find some pictures of it in the manual for XYZ SPACEFRAME VEHICLES here. We aim to take this project all the way and make our art part of everyday life for any person that would like it to be so. In order to find out if its possible to establish a fair way of producing and selling things locally under the realm of Open Source, and Creative Commons, we have decided to set up a MICRO BUSINESS producing and selling XYZ CARGOs locally and under fair conditions. 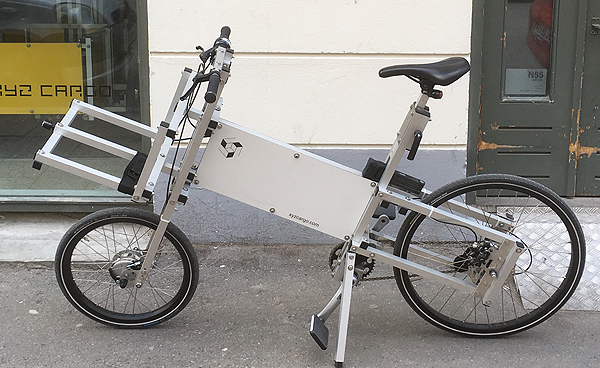 We have been working for months in order to refine the design and production and we hope to be able to deliver homemade XYZ CARGOs in the spring. 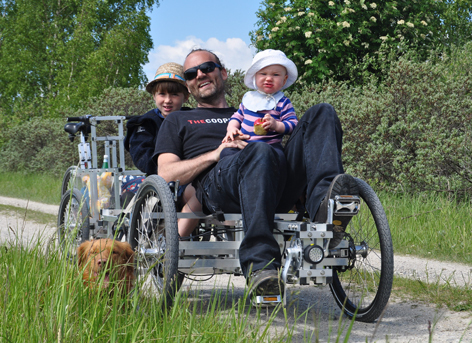 At the beginning of next year a crowdfunding campaign will be set up, enabling everyone to support this further development of XYZ SPACEFRAME VEHICLES. Also we are searching for collaborators in production and distribution here . An internet store possibility for online ordering of XYZ CARGOs will be available soon. Until then inquire about prices ETC and place your order here. 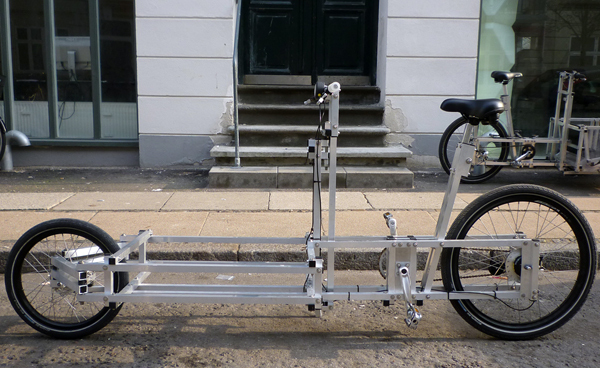 The manuals for the basic XYZ construction principles and the XYZ recumbent type will nonetheless remain for public download as specified here. 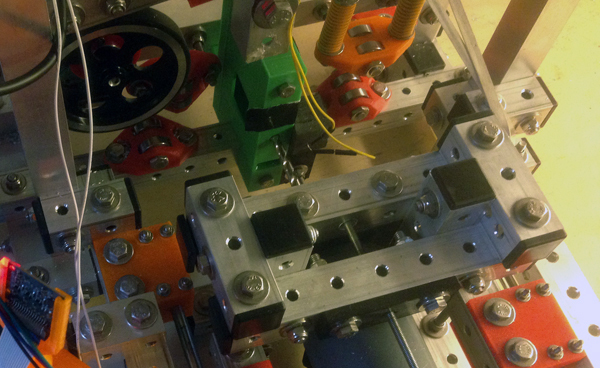 the further development of the SPACEPLATES system. We have published two new N55 TEXTS: WE ARE ALL DESIGNERS, and THE POWER OF LOGIC VERSUS THE LOGIC OF POWER-urban planning. 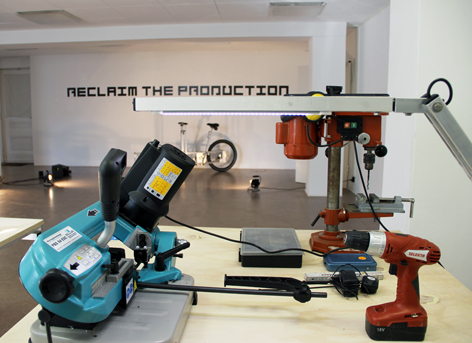 A new MOVEMENT CAMPAIGN has been launched: RECLAIM PRODUCTION. More about this soon. What if a simple construction system could be used to build most of the things persons need in their everyday life, in a sustainable way, from houses, vehicles to furniture etc? Manual for XYZNODES will be published soon! 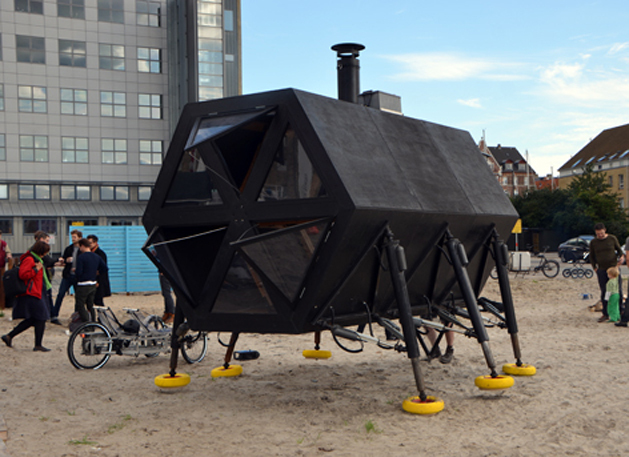 The WALKING HOUSE has been moved to PB43 in Copenhagen. We are working on fixing a computer problem at the moment. See WALKING HOUSE walk here. 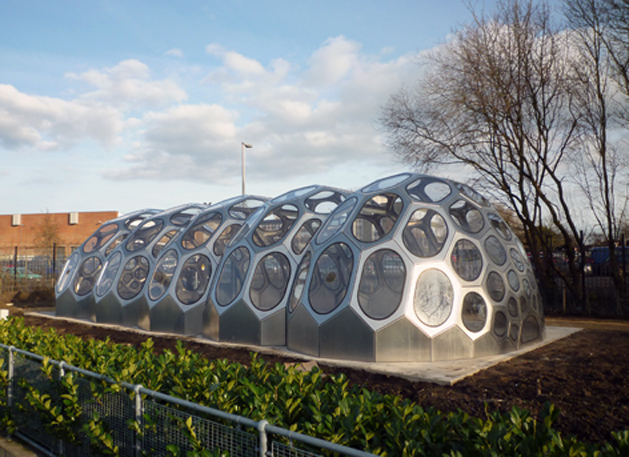 We are proud to present the first large scale version of the SPACEPLATES building system developed by N55 in collaboration with Anne Romme: The SPACEPLATES GREENHOUSE in Bristol, UK. You can see a video documentation here. See the manual here. 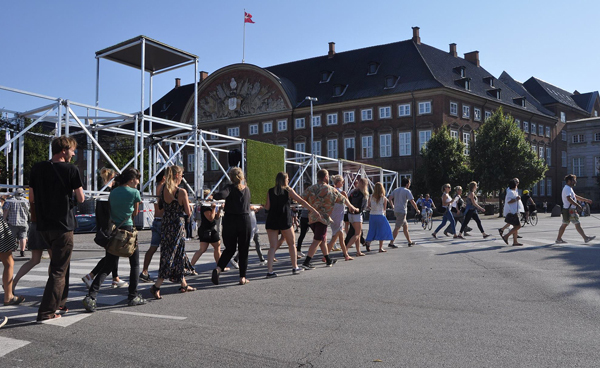 WALKING HOUSE is now part of the ONE CITY CAMPAIGN in the center of Copenhagen.ONE CITY CAMPAIGN is a collaboration between N55, Anne Romme and the INSTANT HERLEV institute. The ONE CITY CAMPAIGN attempts to create connections between the urban and the suburban. A number of things and persons will participate in the ONE CITY CAMPAIGN during the comming year. 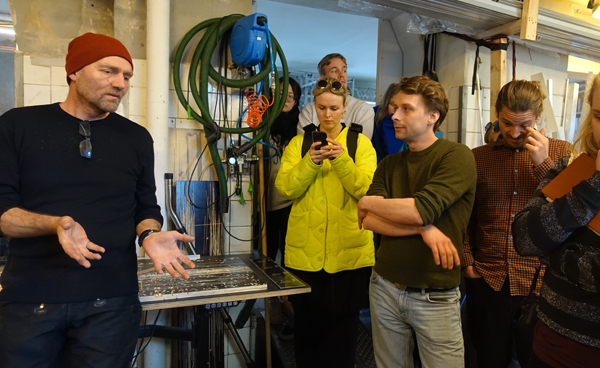 The N55 ship, the SHIP OF FOOLS will be moored at a central site in Copenhagen, where food will be grown etc. 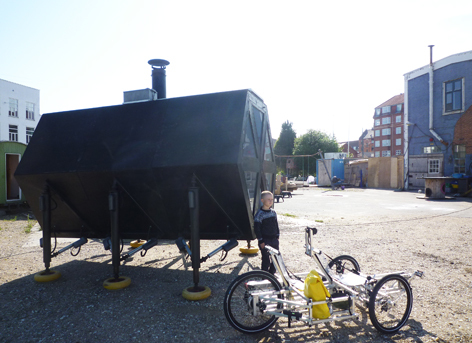 The SHIP OF FOOLS together with the WALKING HOUSE will serve as accomodation for persons working in the situation. You can see WALKING HOUSE walk here. Watch a time lapse video here. The very first steps can be watched here. Or read about it in Dwell magazine here. 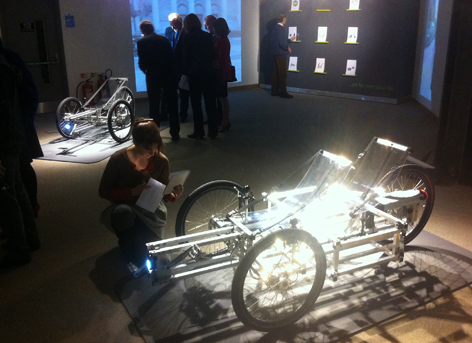 XYZ SPACEFRAME VEHICLES are also part of the ONE CITY CAMPAIGN. Please see the manual here or watch them in action here. COMMUNAL BAKERY was realized last spring in Rotterdam and will be part of the ONE CITY CAMPAIGN this summer in COPENHAGEN. DISCUSSIONS have been updated. Read new text here. 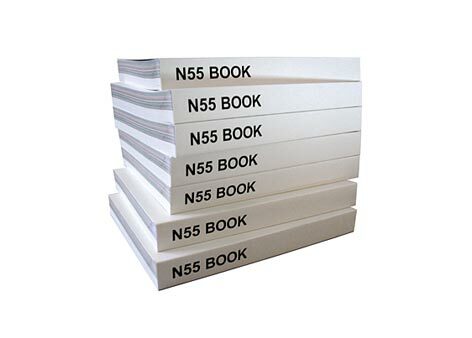 A digital version of N55 BOOK can be downloaded for free here.